Downtown Dining Week, Why Not YEG Restaurant Week? The Downtown Business Association (DBA) is celebrating the end of, what I suspect was, another successful run of Downtown Dining Week (DTDW) in Edmonton, Alberta. For the eleventh year in a row, they have brought diners out to try menus from 30 different restaurants located in the city’s core. Over a period of ten days, people were able to sample a variety of menus that included $15 lunches as well as $25 or $50 dinners. 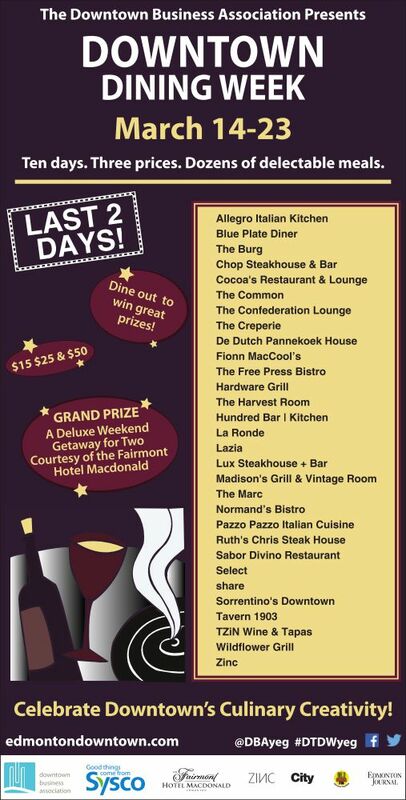 An ad for Downtown Dining Week that I pulled from the Edmonton Journal website. Being that I work in the area, I took every chance I had to eat at as many places as I could over the 10-day period. It only amounted to five meals for me, but, personally, I couldn’t imagine having such rich meals for both lunch and supper every day in such a short amount of time anyway. I especially savoured the opportunity to visit restaurants that have a reputation for great food, but that I may not typically go to on a whim because of the prices, which meant I ventured over to the Hardware Grill, Madison’s Grill, Ruth’s Chris Steak House, Sorrentino’s Downtown and Normand’s Bistro. All of them did an excellent job of helping us to watch our wallets while delivering top-notch food, even when the dish was as simple as a pulled pork sandwich. Although, in my opinion, a few establishments should have worked a bit harder to entice people; they could have ventured away from their regular dishes to experiment with something new, or refrained from picking the least expensive plates from their usual selection of fare (if it costs the same to dine with them during DTDW as it does on any other night, it means it isn’t really “specialty-priced” as per the description on the DBA site) as part of the attraction of the event is that it provides deals where they aren’t typically found, making it a lot more affordable. Regardless, the majority of the DTDW menus had variety, giving you the choice of more than one item per course that ranged from salads and sandwiches to hearty pork and steak dishes or fish to pastas. Every lunch consisted of two courses and each dinner had at least three (appetizer, entrée and dessert). 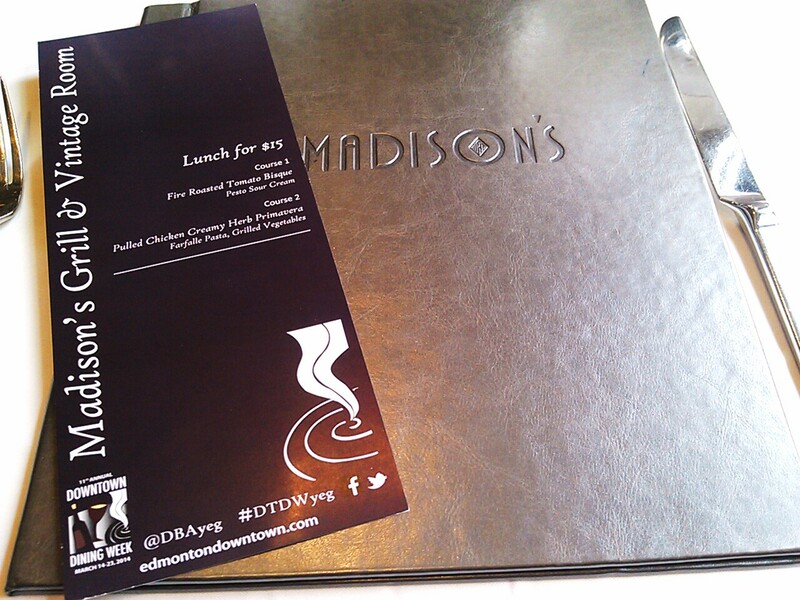 The Downtown Dining Week menu at Madison’s Grill, along with their regular menu. Now, my qualm with DTDW is that it continues to remain the same size. The food festival, if you will, hasn’t really expanded year after year. In fact, it may have even shrunk slightly in terms of the number of restaurants participating. Some of the same restaurants come back annually, others are replaced with new ones (the Confederation Lounge, Tavern 1903, Normand’s Bistro, The Burg, De Dutch (see previous review) and Fionn MacCool’s are the latest additions). I like that there are repeats because, if I didn’t have a chance to go to one the previous year, maybe I’ll be able to visit the next time. However, I would love it if the list of new places partaking got bigger every March. To me, Edmonton is a city with a burgeoning food scene that deserves to be showcased. More and more chefs and entrepreneurs seem to be taking the leap and succeeding at making Alberta’s capital first-rate in terms of the availability and assortment of quality places to dine out. In my mind, DTDW should be growing, not just sustaining. I picture it being at least as large as Calgary’s The Big Taste, which is citywide and has more than 70 “Revolutioneateries” getting involved over ten days. 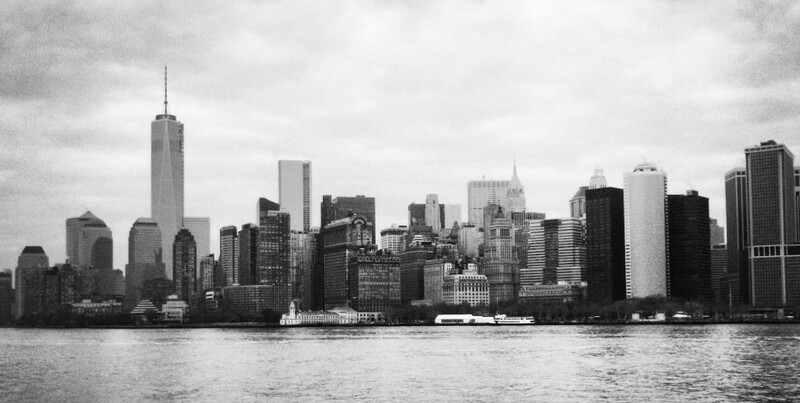 Ideally, it would become similar to NYC Restaurant Week, lasting about three weeks (sometimes extended) and runs both in the winter and summer seasons. Of course, this might be wishful thinking on my part. I can only speculate as to the difficulty of putting something like this together. I’m sure the DBA has attempted to increase the number of establishments taking part in DTDW. I asked my friend who works for the urban planning office with the City of Edmonton what streets constitute the downtown area and while she wasn’t able to answer me right away, I did Wikipedia it. According to the information logged on the wiki, downtown Edmonton is bounded by 109 Street, 105 Avenue, 97 Street and 97 Avenue. If that’s the case, the DBA has stuck within the appropriate grid. Yet, some consider surrounding communities like Oliver to the west to also be part of downtown. That would include everything from 109 Street up to 124 Street from Jasper Avenue to 105 Avenue. Can you visualize how amazing DTDW would be for all you foodies out there if that area were included? 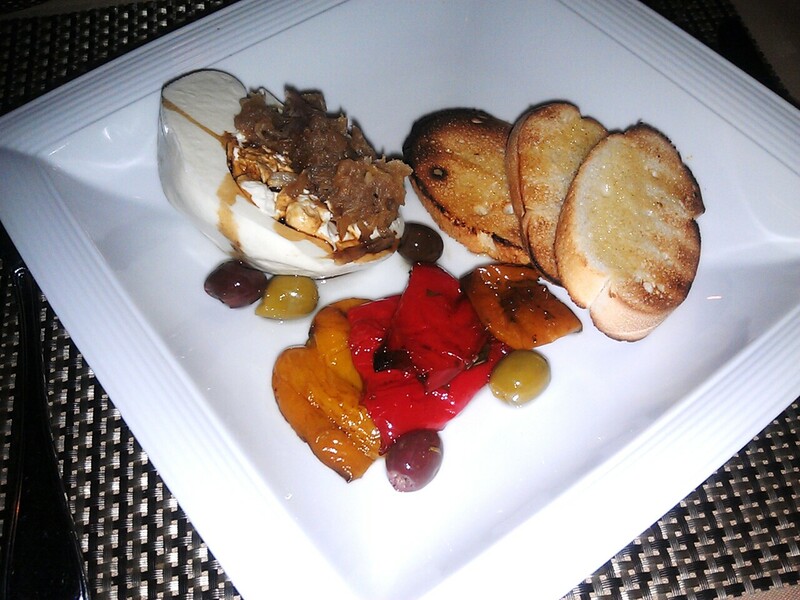 More delicious food like this dish from Hardware Grill – Fresh Burrata Mozzarella! Dishcrawl, an online community of culinary enthusiasts, with a branch in Edmonton has organized events focused around various parts of the city, 124th Street being one of them. I attended a crawl where we walked door-to-door between eight establishments tasting samples and drinks, but not full-out meals. I think that those restaurants, having participated in Dishcrawl’s Neighbourfood event, would be highly interested in adding their names to a dining week list (I could be wrong; I don’t know how it ultimately affects the costs and revenues for the restaurants, but the publicity that may lead to repeat business is a big positive for them, I would think). Would that mean the DBA would still be the sole host of Dining Week in that type of incarnation? Maybe not. It would likely mean several separate dining weeks spread out throughout the year, or more hands in the pot with a joint event put on by the DBA and the 124 Street Business Association (really, any number of other groups that are willing to take part) to make this something that brings the Edmonton restaurant community and food lovers together. It’s all about providing extra exposure to those that participate, no matter where they are located, and expanding the dining week (or month!) theme so that Edmontonians can truly appreciate the diversity of amazing food that exists in this city while, hopefully, finding some new favourites. That’s the goal I see!